Use this comprehensive agreement to buy a B2B or B2C Internet service business, with no premises/work from home. Large menu of warranties! 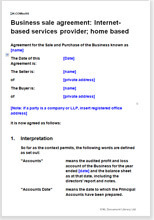 This is a comprehensive business agreement for you to buy from an individual or a company or any other organisation. If you are buying the actual company, this agreement is not suitable. See our Company sale agreements section. It is usual for the buyer to produce the sale document but there is no reason why the seller should not obtain an advantage by making the document his. Explanatory guidance notes in plain English are included.